The passage that follows is a log of our Roque Bluffs, Maine vacation for one week. This would be our one family vacation together where we actually took a trip together in 2010. So here is our day-by-day description of how our vacation went, where we ate, what we did, and more. If you are planning a trip to the Roque Bluffs, Maine area then perhaps some of the info that follows will be useful. Where: Roque Bluffs, Maine. 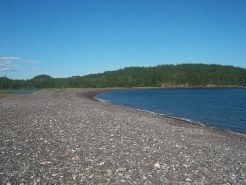 Roque Bluffs is located on a peninsular of land just south of Machias. From the Freeport, Maine area it is about a four-hour long drive. We came up Route 295 north, then Route 9 east, then Route 193 to Cherryfield, then Route 1 East towards Machias. Click here to view a map of Roque Bluffs by MapQuest. Lodging: Our cottage is very nice with two bedrooms, 1 1/2 bathrooms, and a roomy floor plan - upstairs and down. The cottage comes with all the amenities. The living room, kitchen and outside deck has a wonderful view of the Little Kennebec Bay. See the following link to view the cottage online - Sea Spray Cottage. 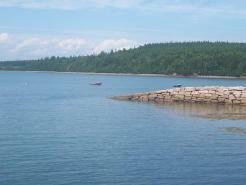 It is located at the water’s edge on the eastern edge of the Roque Bluffs peninsular overlooking Little Kennebec Bay. Saturday. We arrived on Saturday evening around 5:00 pm. The cottage (really a house) that we stayed in was wonderful. The dirt/stone road the cottage is located on is private and secluded. No traffic - with just the sound of sea gulls and the occasional lobster boat. The weather started off cloudy and raining; but the last four days were super - sunny and in the low 70s. The cottage had a full kitchen so most of our meals we ate in. Saturday night was a spaghetti dinner and red wine. It has a wonderful view. Sunday. We had our morning coffee on the deck of our rental cottage overlooking Little Kennebec Bay. The seagulls were going to and fro and the lobster buoys were bobbing about. Once we had breakfast done we took a drive through Machias (north of Roque Bluffs) along the main streets and back roads. Machias is a pleasant coastal town and we found many places we want to explore on our one-week vacation. While driving back to our ocean-side cottage we stopped at Hannaford's on Route 1 for some provisions for the week. My wife picked out the groceries and loaded cart. I pushed the cart and picked out the beer! Lunch was at the cottage. We saw some kayakers going by and chatted with them. Turns out they live just down the coast about 1/2 mile. Later we went to Roque Bluffs State Park and visited the beach. Nice facilities there. It is a $3.00 fee per adult unless you have the seasonal Maine State Park Pass (which we do). Although it was a Sunday, very nice weather day, and in the summer it was not crowded at all. We left the beach and went hiking on some of the trails in the park. The trails are well-marked. After our 3-mile hike we did some driving around the peninsular and looked at all the nice homes we wished we owned! Then home to the cottage for some outdoor grilling and rest. A nice vacation day! Monday. Rain, rain, and more rain. A quiet day in the seaside cottage reading books and working on the computer. We had a kayak delivered from a kayak rental business located in Machias called Sunrise Canoe and Kayak. There are lots of kayak rental places along the coast of Maine but Sunrise seems the closest to us. Cost $25 for the delivery and about another $125 of four days of use. Later that day my daughter and I rode the mountain bikes along some of the dirt roads on the peninsular. It was a good day for my wife an daughter to do their yoga exercises. Tuesday. The weather was better today (Tuesday). 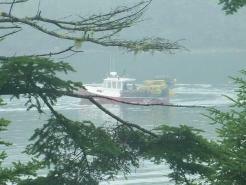 A lot of lobster boats out on the water today. It was nice having coffee on the deck watching them work. My daughter and I went out on the rental kayak. It is a fiberglass open two-seater - somewhere on it there is an inscription that says Old Town Twin Otter (that is as technical of a description you will get from me). We went out in the morning for about 1 1/2 hours up the Little Kennebec Bay all the way past Foss Point and our arms and shoulders were sore for a while after we returned (think Motrin). Lunch was a steak meal grilled on the porch overlooking the water. In the afternoon my wife and I drove our daughter to Ellsworth to drop her off with a friend who is living for the summer on Deer Isle. Then we returned by 8:30 p.m. to our seaside cottage. Kayaking in Little Kennebec Bay off the eastern shore of Roque Bluffs, Maine. The small speck in the middle of the water is our kayak heading north. Wednesday. Day Five of our Roque Bluffs, Maine vacation was spent on the road. 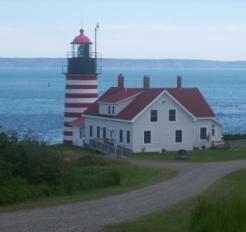 We drove north to Lubec, Maine to check out the eastern-most location of the United States. 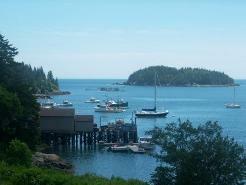 Our first stop was visiting Fort O'Brien - a beautiful view of Machias Bay from the hilltop. Then we took Route 191 traveling through the coastal towns of Cutler (Destiny Bay is beautiful) and South Trescott. 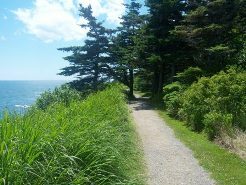 We got off Route 191 and headed east along Boot Cove Road to Quoddy Head State Park where one finds hiking trails, a beautiful ocean park, and West Quoddy Head Light. Then on to Lubec where we walked along Water Street and ate at one of the cafes. Lubec is a wonderful ocean village. We bought some delicious chocolate at Bayside Chocolates on Water Street. As the end of the day was approaching we headed back to Roque Bluffs - taking Route 1 south (or west) through West Lubec and Whiting. Dinner was hotdogs on the grill. A nice late evening walk along quiet roads finished up the evening. Thursday. On Day Six we decided to stay close to the cottage. 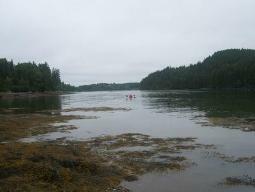 We went out kayaking early in the morning - leaving about 9:00 a.m. and returning at 10:30 a.m. Our course took us south in Little Kennebec Bay, around Johnson Point (which is on the Bucks Harbor peninsular), into Mill Pond, and then return. To us (inexperienced kayakers) it was an adventure; although once we looked at the map is seems like a short distance. We did build up an appetite for a second breakfast so we had some omelet's. The afternoon brought reading on our deck and then a nap (sometimes referred to as GBNT). 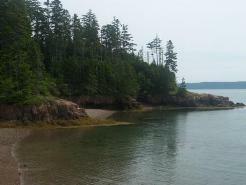 Later we drove to Machiasport and Bucks Harbor on an exploration (sightseeing?) . We visited Jasper Beach on Bucks Harbor. Later we drove to East Machias where we walked along the multi-use trial (an old railroad bed converted to trail use - see Sunrise Trail). Back to the cottage for a grilled chicken dinner on the deck (as I type the wife cooks!). Friday. On Day Seven we decided on no long trips - we wanted to enjoy the cottage. 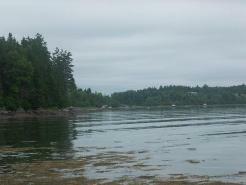 We did another kayak trip for about 1 1/2 hours in Little Kennebec Bay - heading north. The tides and currents were favorable - as was the weather. Then a nap (or GBNT). My wife did some Internet surfing and laundry. 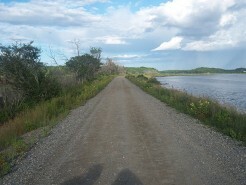 I headed to Machias and rode for two hours on the Sunrise Trail on my mountain bike. I started in Machias and went west to Whitneyville then returned. Stopped at a Dunkin Doughnuts for a energy drink and then headed out along the trail to East Machias and then returned. I was back by six p.m. in time for hotdogs and cheeseburgers on the grill. Saturday. Our vacation has ended. 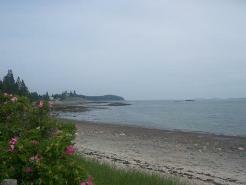 We have completed our drive south along the coast and we are now at our home in Maine. We hope to have another one-week long vacation in the fall. If only it can be as good as this past week! "A pictorial history of northern, downeast, and central Maine"